As we approach Thanksgiving and the holiday season, it’s natural to reflect on what we’re thankful for. In yoga, the closest concept to gratitude in Santosha – contentment. This is one of the eight limbs of yoga – yes, yoga is so much more than our movement through asanas. 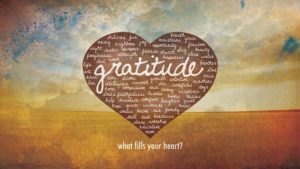 One way to practice Santosha is to focus on what we’re grateful for. Try this tiny gratitude practice to deepen your sense of peace during the holidays. Think of one thing you’re grateful for – something that makes you smile and feel good. As you focus on the feeling of gratitude, breathe in slowly through your nose and allow this feeling and energy to fill your body. Imagine the breath transporting this river of pure joy to every cell, especially filling your heart with a peaceful sensation. As you slowly exhale, experience peace and allow the joyful feeling to soften into contentment. Take a few more breath cycles, repeating this exercise to deepen your sense of joy, contentment and peace. You can stay in this pattern for as long as you like, but try to take at least 10 full rounds of breaths before stopping. I challenge you to do this exercise at least once a day for the next seven days. I recommend doing it upon waking, before each meal and when you go to sleep – but you decide what works best for you. It’s only a few breaths and takes a minute or two to experience this peaceful sensation. On Thanksgiving Day, take time to do the exercise on waking to honor the day. Notice if you feel different than you do now. And if you enjoyed the practice, keep doing it! The holidays will be more peaceful and joyful when you take time to pause, breath and appreciate the goodness in your life. Wishing you a week of Santosha.